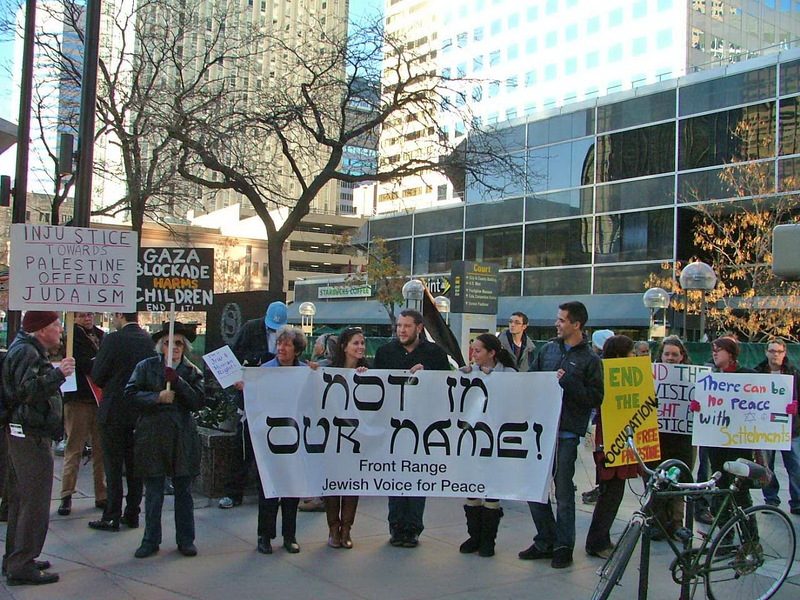 Earlier this week US Campaign coalition member groups Front Range Jewish Voice for Peace, Sabeel Colorado, CU-Divest! and the Rocky Mountian Peace and Justice Center braved the Denver cold to picket for peace outside the Jewish Federations of North America (JFNA) General Assembly (GA). Israeli Prime Minister Benjamin Netanyahu had originally been slated to speak at the GA, but was forced to cancel due to scheduling conflicts. You may recall that Netanyahu's speech last year before the GA in New Orleans attracted widespread news media attention when activists from the Young Leadership Institute of Jewish Voice for Peace interrupted the speech to protest Israel's occupation, the ongoing siege of Gaza and the silencing of dissent. In October it was revealed that the JFNA had disqualified Jewish Voice for Peace activist Cecilie Surasky from their "Jewish Community Heroes" contest because of her active support for boycott, divestment and sanctions against Israel. Speaking to Haaretz last week about Surasky's ban from the contest, JFNA CEO Jerry Silverman defended the decision saying that JFNA "draws a line in the sand for organizations that support boycotting, divesting and sanctioning Israel" as well as those that "disrespect Israeli leaders," referring to JVP's involvement in disrupting Netanyahu's speech last year.